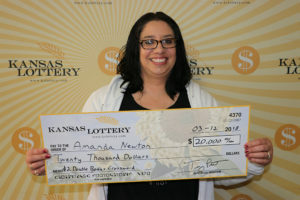 TOPEKA, KAN. – Amanda Newton of Solomon, Kansas is a big fan of the $2 Double Bonus Crossword instant scratch game. For the second time, she won a top prize of $20,000! “I bought four tickets and gave two to my mom and kept two for myself. We always split the tickets that we buy. My first ticket was a $2 winner, and then the last one I scratched was the big one!” said Newton. Newton was apprehensive at first, as crossword games require the player to follow the directions and letters carefully. “I’ve been known to accidentally scratch off an “E” when I thought it was an “F,” so I had my mom check the ticket for me as well. When she also saw a winner, that’s when I knew it was real,” she added. The win comes at almost the exact same time as her previous $20,000 prize win 7 years ago. “This is the same time that I won previously, because it comes right before one of my sons’ birthdays. This must be my lucky season.” said Newton. Newton has plans to pay off a few bills, and will use the rest of the money to have some fun with her husband and three sons. “We’ve really wanted to visit Yellowstone as a family, and now it looks like we’ll be able to go. We’re all very excited!” she said. The winning ticket was purchased at Kwik Shop 739 at 1600 S. 9th Street in Salina. There are still 19 top prizes left in the $2 Double Bonus Crossword game. For more information on games, promotions, winning numbers, and unclaimed prizes, visit our website www.kslottery.com.